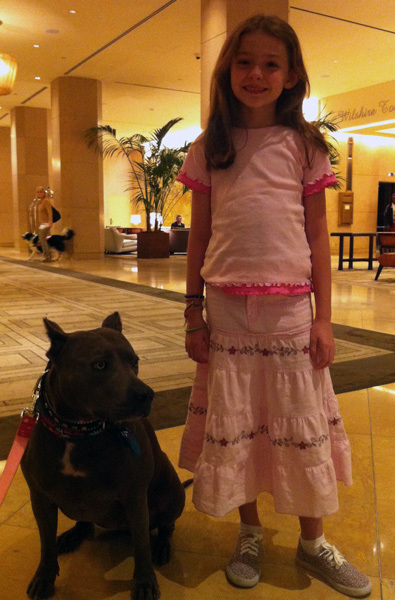 Victoria's daughter, Alex, with the 2013 Hero Dog Award winner - Elle the pit bull. Both will join Victoria to kick off Dog Bite Prevention Week 2014. May 18th-24th is Dog Bite Prevention Week, and Victoria is heading to Washington, D.C. to take part in a press conference at the National Press Club on Thursday, May 15th. She is teaming up with the National Dog Bite Prevention Coalition, which includes State Farm, the U.S. Postal Service, American Humane Association, American Society for Reconstructive MicroSurgery, Insurance Information Institute and Prevent the Bite, to raise awareness about the importance of educating the public about responsible dog ownership and dog safety. Just last year, State Farm paid $104 million as a result of dog bite claims. Despite these staggering numbers, they have continued their policy of not discriminating against a dog's breed when writing or renewing homeowner's insurance because they believe that any dog can bite under the right circumstances, and breed is not a determining factor in the risk of a dog bite. At this week's press conference, representatives will demonstrate the correct way for children to approach a dog, with assistance from Victoria and her daughter, Alex. They will also be joined by the 2013 AHA Hero Dog of the Year, Elle the pit bull, and her owner Leah Brewer. According to the CDC, dog bites were the 11th leading cause of nonfatal injury to children ages 1-4, the 9th for ages 5-9, and 10th for ages 10-14 from 2003-2012. It is estimated that insurers across the country paid over $483 million in dog bite claims . American Society for Reconstructive Microsurgery reports that 26,935 reconstructive procedures were performed in 2013 to repair injuries caused by dog bites. US Postal Service reports that 5,581 postal employees were attacked by dogs in 2013. American Humane Association reports that 66% of bites to children occur to the head and neck. With proper education and responsible dog ownership, these statistics can be improved. Check out this great infographic from the AVMA about the numbers behind the dog bite epidemic. Read more about Dog Bite Prevention Week. With the intention of reaching those across the pond, Victoria has also announced the National Dog Bite Prevention and Behaviour Conference in the UK. This two-day conference will take place in Odiham, Hampshire from May 31st-June 1st. Victoria will be joined by the world's top canine behavior experts, lawyers, and educators to create this national event dedicated to finding practical and workable solutions to help prevent dog bites and dog attacks. The conference is open to the public and your registration fee includes free parking and full lunch both days. Register for the UK Dog Bite Conference here. It's Me or the Dog Now Casting in NYC! Now Accepting Video Submissions for 'Ask Victoria'!